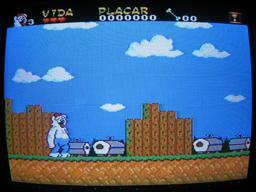 Other Released Names: Asterix (in Europe). Formats Released: The Four Mega Cartridge. 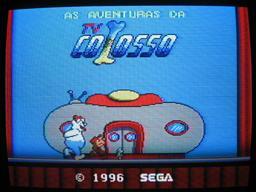 The show TV Colosso invades all the televisions in the world in a fascinating adventure for the Master System! Chelfinho isn't feeling very well. His worried doctor prescribes a rare combination of six herbs to restore him to health. However, these herbs are only found in the wild and it's up to Priscila and Gilmar to find them! But it seems that the Fleabag society is out to confuse our canine heroes... Six levels of fun with three stages each. Choosing between Gilmar and Priscila in each level is important, since due to their differences one can be more beneficial in a certain level than the other to overcome difficult obstacles. 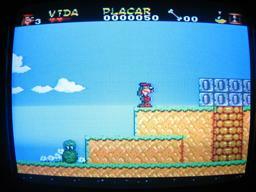 After each level you get to view different, well-colored and detailed scenes. Caves, boats, subterranean passages lie in wait for you, brining countless enemies - disguised fleas - to be eliminated. The maximum of everything, and it's all in Portugese so you can easily understand the story. Brazilian website with information about the show.